UPDATED: Thu., June 7, 2018, 10:41 p.m.
Tag (2018) Based on the true story of 10 Spokane guys and their never-ending game of tag, this comedy starring John Hamm, Jeremy Renner and Ed Helms will be released June 15. West of Redemption (2015) Cornelia Moore, who directed “Camilla Dickinson,” returns to Spokane to helm this thriller starring Billy Zane and Mariana Klaveno, who hails from Endicott, Washington. Knights of Badassdom (2013) About a bunch of live-action role players (LARPers) who accidentally conjure up a demon from hell. Location is Riverside State Park. At Middleton (2013) Oscar-nominees Andy Garcia and Vera Farminga in a romantic comedy about two people who meet while touring prospective colleges with their kids. Scenes from Spokane, Gonzaga University and Washington State University. 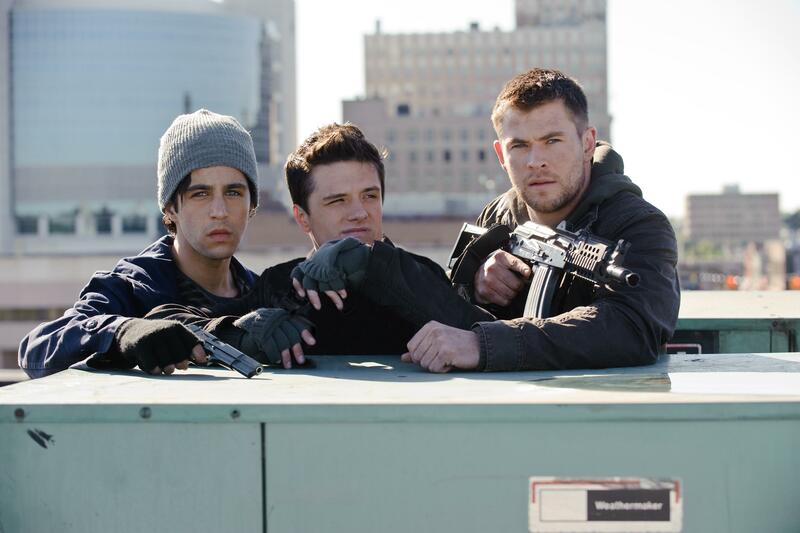 Red Dawn (2012) This remake of the 1980s teen drama stars Chris Hemsworth and is only set in Spokane. Camilla Dickinson (2012) Spokane stands in for 1948 New York City in this film adaptation of the Madeleine L’Engle coming-of-age novel “Camilla,” about a 15-year-old girl (Adelaide Clemens) who starts to find her own way in life when her parents’ (Cary Elwes, Samantha Mathis) marriage falls apart. Scenes shot around the Fox theater, the Davenport Hotel, and the lobby of The Spokesman-Review Tower at Monroe Street and Riverside Avenue. Different Drummers (2012) Family drama inspired by a real-life friendship. The Ward (2010) John Carpenter made this movie in Spokane and at Eastern State Hospital in Medical Lake. The Hit List (2010) Last of four films made in Spokane starring Oscar winner Cuba Gooding Jr. He also made “Wrong Turn at Tahoe” (2009), “Lies & Illusion” (2008) and “End Game” (2006). Give ’Em Hell, Malone (2009) This P.I. thriller, set in the 1940s, stars Thomas Jane and Ving Rhames. Home of the Brave (2006) Iraq war drama directed by veteran Hollywood producer Irwin Winkler and starring Samuel L. Jackson, 50 Cent (aka Curtis Jackson), Jessica Biel and Christina Ricci. Mozart and the Whale (2005) Josh Hartnett and Radha Mitchell star as two young savants who must deal with Asperger’s syndrome. The Basket (1999) Rich Cowan directs Karen Allen and Peter Coyote along with local talent in drama about finding acceptance through basketball. Smoke Signals (1998) Based on the acclaimed Sherman Alexie short story “This is What it Means to Say Phoenix, Arizona.” Alexie adapted the screenplay and co-produced the award-winning indie film. A significant portion of the film was shot on the Coeur d’Alene Reservation in Idaho, but several scenes were filmed in Spokane, including at the old Greyhound station on Sprague Avenue, and Riverfront Park. Benny & Joon (1993) Filmed in Spokane and loaded with stars – Johnny Depp, Mary Stuart Masterson, Aidan Quinn, Julianne Moore, William H. Macy, CCH Pounder, Dan Hedaya and Oliver Platt. Vision Quest (1985) Filmed in Spokane and starring Matthew Modine, this coming-of-age drama was based on a novel by former Shadle Park High School teacher Terry Davis. Why Would I Lie? (1980) Spokane was the primary location in this film starring Treat Williams. *Bing Crosby (1903-77) - Not born in Spokane (Tacoma, actually), but the city claims him a million times over. While primarily a singer, Crosby won an Oscar for his performance in “Going My Way,” and starred in a bunch of road movies with buddy Bob Hope. Susan Peters (1921-52) - Nominated for Academy Award for best supporting actress in “Random Harvest” (1942). Michael Winslow (1958) - Best known for making sounds with his voice in the “Police Academy” movies. Cheyenne Jackson (1975) - He is best known for his stage acting, but has been in several films including “United 93” (2006), which received two Academy Award nominations. Trevor St. John (1971) - Had a role on the soap “One Life to Live” and has played bit parts in several movies, including “Tarzan” (2012) and “The Bourne Ultimatum” (2007). Jordan Fry (1993) - Best known for the role of Mike Teavee in “Charlie and the Chocolate Factory” (2005). Published: June 7, 2018, 9:38 p.m. Updated: June 7, 2018, 10:41 p.m.